Gene Elden Likens (born January 6, 1935) is an American limnologist and ecologist. He co-founded the Hubbard Brook Ecosystem Study at the Hubbard Brook Experimental Forest in 1963, and founded the Cary Institute of Ecosystem Studies in Millbrook, New York in 1983. A leading pioneer in long-term multidisciplinary ecological studies, Likens examines energy flow and biogeochemical flux models in the ecosystems of forests, streams and lakes. Likens is best known for leading the team of scientists that discovered acid rain in North America, and connected fossil fuels with increasing acidity of precipitation. In addition to its scientific impact, this work has influenced public debate and governmental policy, particularly the United States Congress's Clean Air Act Amendments of 1990. Gene Likens was born in Pierceton, Indiana. Likens received his B.S. in zoology at Manchester University (North Manchester, Indiana) in 1957, followed by his M.S. in zoology in 1959 from the University of Wisconsin–Madison. He received his Ph.D. in zoology in 1962, also from the University of Wisconsin–Madison, for his thesis on Transport of radioisotopes in lakes. Likens was an instructor and associate professor at Dartmouth College from 1963 to 1969. In the 1960s, Likens did early work in the dry valleys of Antarctica, examining the thermal structures of Lake Vanda and Lake Bonney. Likens was co-founder in 1963 of a group with F. Herbert Bormann, Robert S. Pierce and Noye M. Johnson working on the Hubbard Brook Ecosystem Study at the Hubbard Brook Experimental Forest in the White Mountains of New Hampshire. The study immediately found that the rain was abnormally acidic, and the group carried out one of the first scientific studies linking acid rain to air pollution such as sulphur dioxide from the use of fossil fuels. In 1988, Hubbard Brook was designated by the National Science Foundation as an LTER, a site for collaborative long term ecological research. As of 1 June 2013, Hubbard Brook had been continuously studied for 50 years. Likens' work in the area is considered "one of the world’s most comprehensive studies on how air pollution and land use shape forested watersheds". Work at Mirror Lake, at the lower end of the Hubbard Brook Valley, has been particularly important in understanding the importance of physical, chemical, and biological linkages involving the lake and its watershed and airshed. Likens has extensively studied biogeochemical cycles describing the flow of matter within ecosystems. Riparian zones linking water and land are particularly important in maintaining the health of wild lands. Likens has also done important work on deforestation and its potential impact on the chemistry of watersheds. This research has had significant impacts on programs for forest management, in particular the United States Forest Service's adoption of a 100–year rotation policy. Likens and others devised a range of highly influential long-term experiments on an ecosystemic scale. These include the small-watershed model of nutrient cycling, in which all water entering and leaving a naturally-bounded watershed is measured, enabling scientists to calculate the hydrologic budget of the watershed. This model has been "extremely influential" in the examination of ecosystems, and is central to the examination of urban ecosystems such as Baltimore. Likens' work is considered "classic", and he is credited with establishing a "guiding paradigm" for other ecologists. In 1969, Likens joined the faculty of Cornell University. He served as an associate professor from 1969 to 1972, and as a full professor from 1972 to 1983. In addition to being a professor of ecology in the Section of Ecology and Systematics (later named the Department of Ecology & Evolutionary Biology), he served as its acting chairman (1973-1974) and chairman (1982-1983). In January 1983 he was named Cornell University’s Charles A. Alexander Professor of Biological Sciences. While at Cornell University, he served as chairman of the Section of Ecology and Systematics. "Gene E. Likens, Cary Institute of Ecosystem Studies"
In 1983 Likens founded the (now Cary) Institute of Ecosystem Studies in Millbrook, New York as part of the New York Botanical Garden. In 1993, the IES became an independent non-profit with Likens as director and president. Situated at the Mary Flagler Cary Arboretum, it is an independent center for ecological research, "whose work is highly relevant to policy concerns." In addition to managing teams of scientists and educators, Likens continued his research at Hubbard Brook each summer. As of 2001, he was appointed to the first endowed chair at the Institute of Ecosystem Studies, the G. Evelyn Hutchinson Chair in Ecology. In 2007 Likens stepped down as director of the IES and returned to full-time research, currently at the University of Connecticut and as visiting professor at the University of Uppsala, Sweden. In July 2012 he began a three-year term as special adviser to the president of the University of Connecticut on environmental affairs and distinguished research professor. Likens has published 25 books and more than 580 papers and book chapters. Much of his early work is summarized in U.S. Geological Survey publications. His work has influenced the United States Congress on issues such as the Clean Air Act Amendments of 1990. He has been active in a variety of organizations, and has been the vice-president (1975-1976) and president (1976-1977) of the American Society of Limnology and Oceanography; vice-president (1978-1979), president (1981-1982) and honorary Fellow (2012) of the Ecological Society of America; president (2002) of the American Institute of Biological Sciences; and president (2001-2007) of the International Society of Limnology. Likens has received a substantial number of awards and honors of various kinds. He was elected to the American Academy of Arts and Sciences in 1979, and the United States National Academy of Sciences in 1981. He was also elected as a foreign member of the Royal Swedish Academy of Sciences in 1988, the Royal Danish Academy of Sciences and Letters in 1994 and the Austrian Academy of Sciences in 2000. He became an elected member in biological sciences of the American Philosophical Society in 2006. He's also a fellow of the American Association for the Advancement of Science. His awards include the 1988 ECI Prize in Limnetic Ecology, the 1993 Tyler Prize for Environmental Achievement and the 2001 Huxley Medal of the Institute of Biology, London, UK. He received a 2001 National Medal of Science from President George W. Bush on June 13, 2002. In 2003, Likens and Dr. F. Herbert Bormann received the Blue Planet Prize from Asahi Glass Foundation, for "for outstanding scientific research that helps to solve global environmental problems". In 2014, he received the Alfred C. Redfield Lifetime Achievement Award from the Association for the Sciences of Limnology and Oceanography (ASLO). He has been awarded honorary doctoral degrees internationally (Universität für Bodenkultur, Vienna, 1992; Wageningen Agricultural University, The Netherlands, 1998) as well as nationally (Manchester College, 1979; Rutgers University, 1985; Plymouth State College, University System of New Hampshire, 1989; Miami University, 1990; Union College, 1991; Marist College, 1993; University of Connecticut, 2004; Montclair State University, 2012). Gene Likens and his wife Phyllis Irene Craig Likens (1951-2014) of Clinton Corners, New York have three daughters, Heather, Leslie, and Kathy, and a son, Gregory. Phyllis also worked at Cornell University and the Institute of Ecosystem Studies and contributed significantly to the Hubbard Brooke Ecosystem Study. "Gene Likens Collection, MC2002/188 and MC2002/188b". Manchester University Archives and Brethren Historical Collection. Funderburg Library, Manchester University, North Manchester, Indiana. Wiltshire, Denise A.; Evans, Margaret L. (1984). Acid precipitation; an annotated bibliography U.S. Geological Survey Circular 923 (PDF). U.S. Geological Survey. 1 2 3 4 5 6 7 8 9 10 11 O'Grady, Richard T. (2002). "AIBS President Gene Likens Awarded National Medal of Science". BioScience. 52 (6): 459. doi:10.1641/0006-3568. Retrieved December 9, 2015. 1 2 3 "Unit 8: Gene E. Likens". Pearson Education. Retrieved December 15, 2015. 1 2 3 4 5 6 "Gene E. Likens receives the Alfred C. Redfield Lifetime Achievement Award". EcoFocus Newsletter. Cary Institute of Ecosystem Studies. May 30, 2014. Retrieved December 9, 2015. ↑ Jeschke, Jonathan M. (September 25, 2009). "Likens, Gene E.". The Encyclopedia of Earth. ↑ "Gene Likens Collection, MC2002/188 and MC2002/188b". Manchester University Archives and Brethren Historical Collection. Funderburg Library, Manchester University, North Manchester, Indiana. Retrieved December 9, 2015. 1 2 3 "GENE E. LIKENS Institute of Ecosystem Studies" (PDF). University of Connecticut. Retrieved December 10, 2015. 1 2 Ragotzkie, Robert A.; Likens, Gene E. (1964). "The heat balance of two Antarctic lakes". Limnology and Oceanography. 9 (3): 412–425. doi:10.4319/lo.1964.9.3.0412. ↑ Likens, Gene E. (1962). Transport of radioisotopes in lakes (Ph.D. thesis). University of Wisconsin - Madison. ↑ Doran, Peter T.; Lyons, W. Berry; McKnight, Diane M. (2010). Life in Antarctic Deserts and other Cold Dry Environments. Cambridge University Press. p. 1. ISBN 9780511718168. Retrieved December 14, 2015. 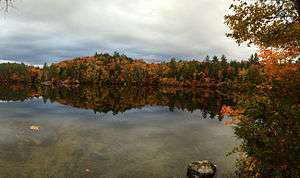 ↑ "Hubbard Brook Ecosystem Study". National Science Foundation. Retrieved November 11, 2007. 1 2 3 4 Rains, Michael T. (2005). "Hubbard Brook Experimental Forest Celebrating 50 Years as a Forest Service National Scientific Treasure" (PDF). Forest Science Review (5). Retrieved December 14, 2015. 1 2 "IES Director Dr. Gene E. Likens Receives the Blue Planet Prize". LTER Network News. 16 (2). November 16, 2003. Retrieved December 9, 2015. ↑ "Acid Rain". Cary Institute of Ecosystem Studies. Retrieved December 15, 2015. ↑ Winter, Thomas C.; Likens, Gene E. (2009). Mirror Lake : interactions among air, land, and water. Berkeley: University of California Press. ISBN 9780520261198. Retrieved December 15, 2015. ↑ Likens, Gene E.; Buso, Donald C. (2013). Biogeochemistry of a forested ecosystem (3rd ed.). New York: Springer. ISBN 978-1461478096. Retrieved December 15, 2015. ↑ Decamps, H.; Naiman, R.J.; McClain, M.E. (2010). "Riparian zones". In Likens, Gene E. River ecosystem ecology : a global perspective : a derivative of Encyclopedia of inland waters. San Diego, CA: Academic Press. pp. 182–189. ISBN 9780123819987. Retrieved December 15, 2015. ↑ CONLEY, DANIEL J.; LIKENS, GENE E.; BUSO, DONALD C.; SACCONE, LOREDANA; BAILEY, SCOTT W.; JOHNSON, CHRIS E. (September 2008). "Deforestation causes increased dissolved silicate losses in the Hubbard Brook Experimental Forest". Global Change Biology. doi:10.1111/j.1365-2486.2008.01667.x. Retrieved December 15, 2015. 1 2 Berkowitz, Alan R.; Nilon, Charles H.; Hollweg, Karen S. (2003). Understanding urban ecosystems a new frontier for science and education. New York: Springer. ISBN 978-0387952376. 1 2 3 4 5 Joseph, Heather (2002). "AIBSnews". BioScience. 52 (7): 627–630. doi:10.1641/0006-3568(2002)052[0627:an]2.0.co;2. Retrieved December 10, 2015. 1 2 3 4 "Gene Likens Ph.D. National Medal of Science - Biological Sciences 2001". Ganga Library Inc. Retrieved December 14, 2015. 1 2 "Dr. Gene E. Likens". Cary Institute of Ecosystem Studies. ↑ Speth, James Gustave (2004). Global environmental challenges : transitions to a sustainable world. Hyderabad, India: Orient Longman. ISBN 8125027408. Retrieved December 14, 2015. ↑ Wiltshire, Denise A.; Evans, Margaret L. (1984). Acid precipitation; an annotated bibliography U.S. Geological Survey Circular 923 (PDF). U.S. Geological Survey. ↑ "Members elected in April 2006" (PDF). News from Philosophical Hall. 10 (2): 10. 2006. Retrieved December 10, 2015. ↑ Likens, Gene E. (1992). THE ECOSYSTEM APPROACH: ITS USE AND ABUSE (PDF). Germany: Ecology Institute. Retrieved December 15, 2015. ↑ "1993 Tyler Laureates F. Herbert Bormann and Gene E. Likens". Tyler Prize. Retrieved December 10, 2015. ↑ "Phyllis Irene Craig Likens Obituary". Ithaca Journal. December 22, 2014. Retrieved December 9, 2015.